That’s quite an odd title coming from me, isn’t it? If you’ve been following a lot of my writing here and on other sites, you’ll know that I’m a real believer in good quality steaming for silk painting. But….in view of the fact that not everyone has the time, space and funds for this whole process, I thought I would share with you some of my escapades with microwaving. So here’s how I’ve been doing it. The first problem I had with microwaving was that I didn’t own a microwave oven. I’m not going into the details here, but I prefer to cook all my food by conventional means. Okay, so that meant I had to go off to Morrisson’s and luckily they had a really basic model which suited my needs. Two dials for timing and heat. That’s all you need for what I’m going to share with you. You’re also going to need some silk dyes, remember, the ones that are specifically for steam fixing. Not the paints which you set by heat. Read the labels on the bottles if you are unsure, or ask the shop assistant for help. 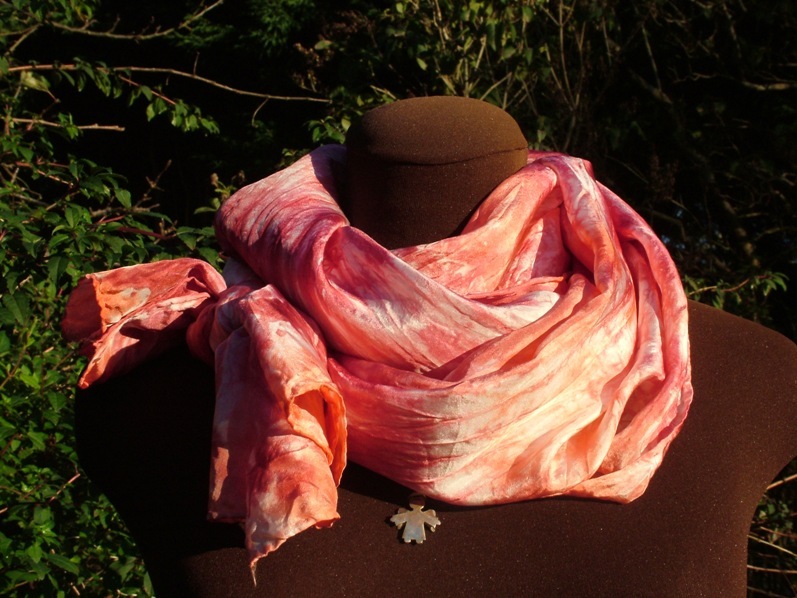 You’ll also need a plain white scarf with rolled edges that you can add the dyes to. 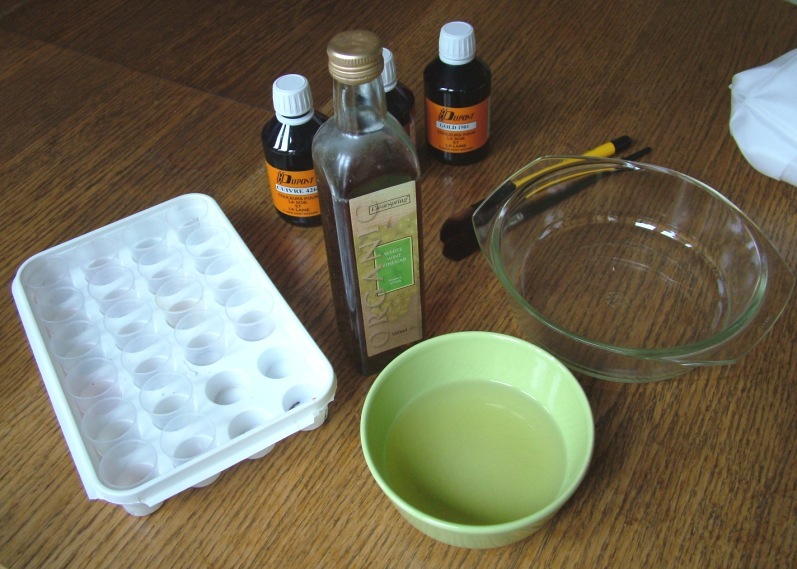 Before you start you’ll need to get a bowl, add a mixture of 2 parts water and one part vinegar, then soak your silk scarf in this for at least 15 minutes. This will improve the dying process and ensure you get lovely bright colours that last. You then take the silk out of the bowl, squeeze it out gently and lay it out on a surface covered with plastic sheeting. Have the dyes and brushes you’d like to use at hand, and you’re ready to go. What you do next is completely up to your own imagination. You are going to start adding dyes to your heart’s content. Pick a nice colour range that would suit you and this will ensure the colours don’t clash. Splash them on with big brushes randomly. 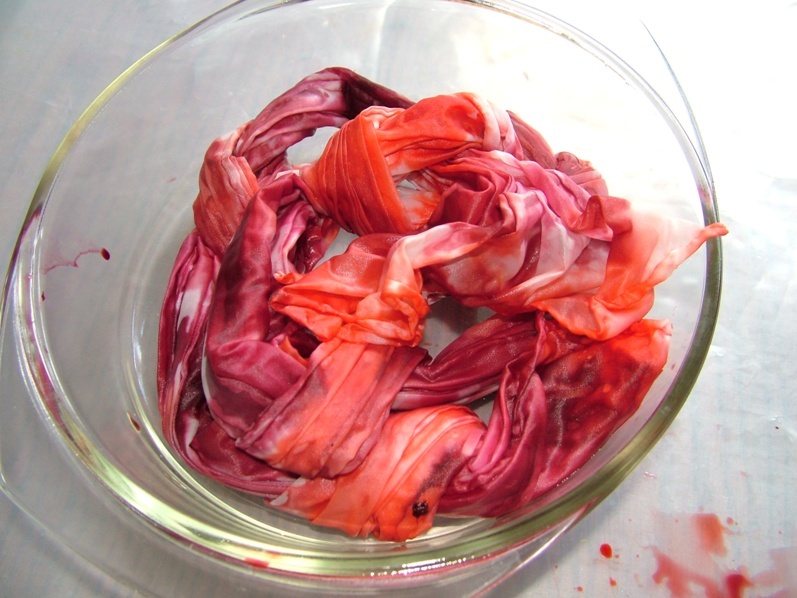 Or you can scrunch the silk up and dribble the dyes into the silk. 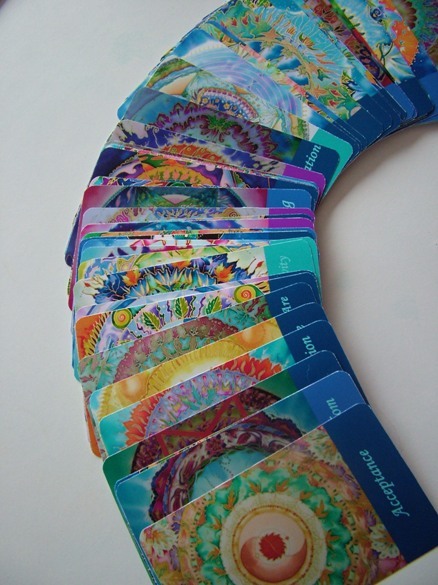 Or what about folding it up and then painting the colours on in patterns? The example I’ve shown here is tying loose knots in the silk before applying the dye. The good news is that I’m in the process of putting together a video we took of me demonstrating this technique at a fair back in the summer, so you can copy what I did to get you started, if you like. The important thing is that you keep the silk nice and wet so that you can properly ‘cook’ it afterwards. Right, now you’re going to lift your silk and place it into a microwaveable dish. Don’t worry if the silk gets a little scrunched here too as your finished scarf will have an abstract pattern to it anyway. What I do next is get a piece of clingfilm and stretch this over the dish – I think it’s called Saran wrap in the USA (that’ll save a few emails). One thing you need to do at this point is prick a hole in the foil. And if you don’t do this? The foil will bulge up and may explode….making a bit of a mess. Now we’re going to place the covered dish in the microwave for 5 minutes at a medium-high setting. Use this time to go back and wipe your plastic covered surface clean. The last thing you want is to have dye spillage messing up your finished scarf. Or you can just lift the sheeting to one side and put it out of harm’s reach. This may sound like Kindergarten stuff, but it’s one of the main causes of people messing up their lovely silks after all the work is done. So, I just thought I’d throw it in again here. Right, the 5 minutes are up, so remember to use some sort of cloth or glove to lift out the hot dish. Carefully remove the foil and lift out the wet scarf. Yes, it will still be totally wet at this point but the dye is fixed so the wetness only comes from water. Now all that is left for you to do is hang up the silk to dry. Later you can rinse it in warm water with a touch of mild shampoo to remove any excess dye and then dab it with a towel. Iron the silk dry from the reverse with a medium hot iron. Another thing you can do for a really fashionable look is twist the wet silk and leave it to dry. That will give you the look you can see in this final photo. And there you are, ready to go. You’re now the proud owner of your very first original silk scarf. I don’t know about you, but I think this is a great way to make yourself something gorgeous in such a short space of time. Do watch out for the video I’ll be posting in the next day or two, so that you can see the whole process in action. Have fun and let me know how things work out for you. I’d love to see your designer scarves. This entry was posted in SILK PAINTING and tagged designer scarves, Fiona Stolze, microwave, silk dyes, SILK PAINTING, SILK PAINTING TECHNIQUES, silk painting video, silk scarf, silk scarves, silkandart. Bookmark the permalink. hi fiona…i absolutely loved going thru this wonder process of microwaving ur silks!i remember having a few words on this with u sometime back but seeing is believing…n i believe it does give wonderful results! m sure this technique can be used to fix plain colored silks too as in not tie-n-dye but just one color?!?!? Muffy, lovely to hear from you again. 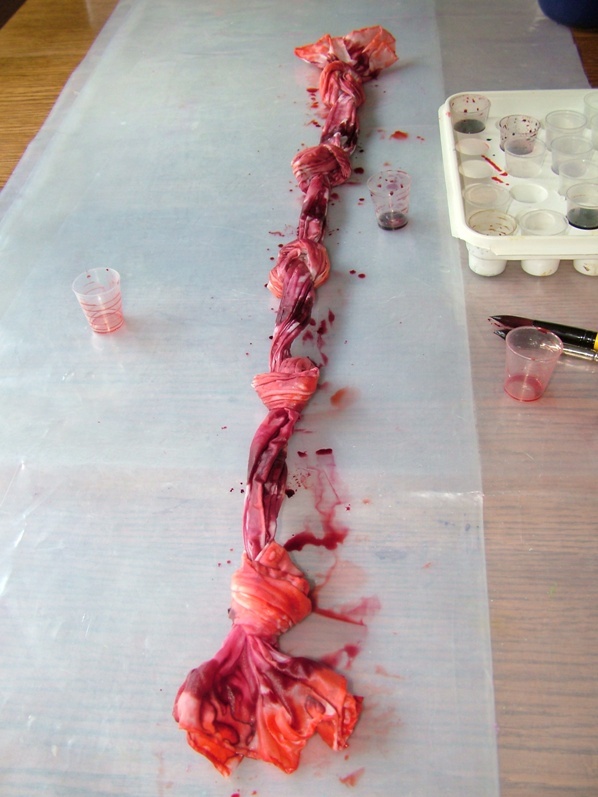 Yes, this idea is just so versatile and gives people an easy start to silk painting. And the cling film, that’s funny. Ceran/Saran – my phonetical transcription. Thanks for putting that right. Have a go Muffy and come back to let me know how things work out. I am going to have to try this! I wear scarves year round – whether it is cold outside or air conditioned in summer. It would be great to wear my own creation. Fabulous to hear that Rachel. Do let me know how things go – I’d love to hear. And don’t hesitate to ask if you have any questions. I am sure that I will have one or two questions!! thnx! Nice, clear and easy instructions. I particularly like the “twist and dry” technique as my iron and I are not friends. Twist and dry is great Pat. And you can quickly make something that goes great with a favourite outfit. The end result is absolutely gorgeous. Not sure mine would look like that if I gave it a try. But you never know. I never considered myself much of an artist but if I could make a scarf that looked like yours I would be very happy. Glad to have brought you some memories Julie. And you’d be surprised what results you would get if you tried this out. It really is quick, easy and fun. The scarf turned out beautifully. This would make a fabulous Xmas present and be meaningful since you made it yourself. Nice demonstration. Now here is something I would never have thought of. Great instructions, and the photos definitely help. Sounds like a wonderful holiday gift. Thanks for your comment Rob. I think it makes a great gift too. Beautiful and so simple! I’m not crafty at all though but my eldest daughter is and she loves scarves. Dare I show her this? Do have a go. You’ll be amazed at the results. And you can give me a shout if you get stuck. 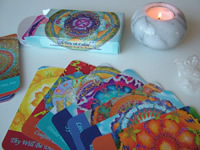 This sounds like so much fun and what a beautiful product as a result! My daughter is so good with this kind of thing, I am going to share this with her and see if she would be willing to give it a try. Once I see how she does, I may try it too! I look forward to seeing your video! Thanks Donna. Maybe the two of you could try it out together. I’d love to see how it turns out. Now that’s fun and something I can do with my grand daughter as she get’s older…and hopefully more grand kids that come a long. Thanks! Glad this could be of use to you Irene. Yes, kids learn this really easily, too. I emailed this to a artsy friend of mine! Awesome blog post! Thanks Kathy. The silk is definitely very stylish and you can use it as a great fashion accessory . So glad you liked this Jen and thanks for your comments. We are really on the same page with this sort of line. I love to make cushions and soft furnishings and have been thinking of all sorts of lovely throws. Really the sky’s the limit with these sort of things – you’re so right. This is a great tutorial on creating a silk scarf at home in the perfect colors. And for a fraction of the cost of purchasing at a boutique shop. Love your explanation with pictures and looking forward to the video. Thanks for taking the “HELP!” out of doing something creative for us non-creative people. Hi Candace, Glad you enjoyed it and hope your sister has a go. Btw. silk screening is a specific printing process which was originally done using frames stretched with silk. This is part of the world of silk painting, using dyes and brushes. Thanks for coming by. What a wonderful tutorial! The photos are art pieces in themselves. I must say I would like a separate blog post on how/why you chose to eschew a microwave. I’ve thought quite a bit about how much I use a microwave (a lot) and wondering if it’s in my best interest. But back to the scarves! Yours is absolutely beautiful and you make the technique sound within reach for us ordinary folks. One question–anything about picking out the scarf to use? Thanks a lot for your comment Judy. I love to take photos and make up these posts. As to the microwave, well, now I just have to make a blog post about the ‘cons’. And the silk scarf itsef – well, you can get plain white scarves in any shop that sells silk painting materials. So where you find the paints, you find the scarves. Thanks for mentioning it as I could add some info about this again. Thanks for this post — nicely written and gorgeous photos, as usual. 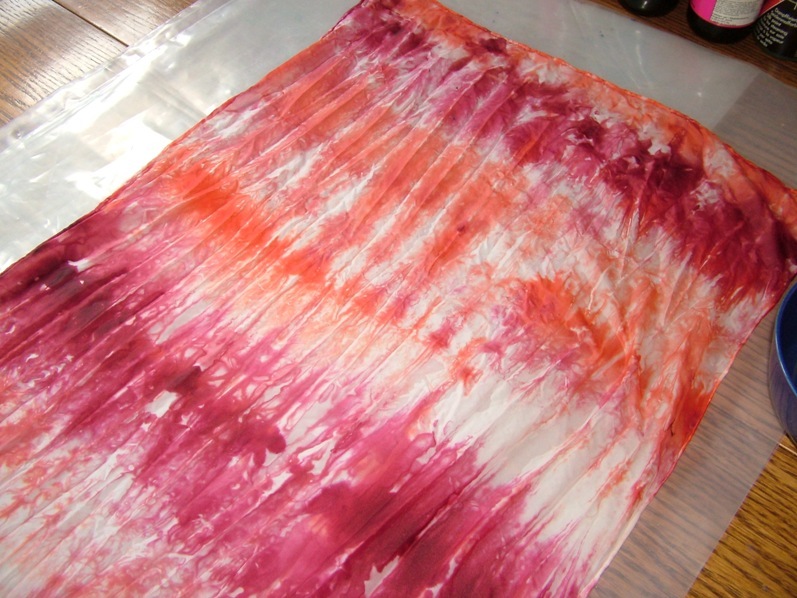 I enjoyed re-reading about how to tie-dye. Back in the 60s, I used to do this with T-shirts, sheets, towels, etc, but never thought to try a silk scarf. Glad you enjoyed this Robbie. Yes, tie=dye is great fun, isn’t it. Technically this isn’t real die-dye as it involves creating some form of resist to create the patterns. You’ve reminded me that I made a real tie-dye about a year ago, so I may just post that one to let you see. The silk is much thinner than cotton and creates different results. Thanks for the ideas. I loved your instructions. They are so simple and easy and you have given me courage to BELIEVE I could do this someday. Make my own scarf kewl! So glad you resonate with this Lisa. Would love to see you make one! Thanks for stopping by. Hiii how long can I keep the scarves before I put them in the microwave?. I am thinking of doing them at school with my students,placing them in marked plastic ziplocks and doing them in mu micro about 4 hrs after dye painted on. Will this work? This only works with the silk wet. Please don’t put any work aside to microwave later. Put it straight into the microwave. These are acid dyes not fibre reactive which need to ‘sit’ in a bag overnight to react with the fabric. Read the instructions through again to make sure you get the right dyes for this method. It’s very important to do it exactly as described. By all means use ziplocked bags but put them in the microwave straight away. Love the scarf and the tutorial was clear and very understandable. Thanks. Did you ever produce the video? If so, how may I access it? Hi Fiona! I love this!! Love it, love it, love it! I do far too little silk painting of late because my…heh…”real job” keeps me too busy and I usually get pretty elaborate when I do work on silk (and I’m a die-hard when it comes to using quality dyes (i.e. Pebeo Silk) and steaming the piece properly. This technique, however, is a godsend and the results look just lovely. I have one question for you though…does the microwave technique work when you’re using gutta? I didn’t get notification of your comment so I do apologise for not replying. I’m glad you love this technique. A quick answer to your question is no. Don’t use gutta in the microwave. It’s only intended for really wet silk. Ideally you would properly steam any silks with gutta or liner on them. Thank you Fiona, I thought as much but wanted to make sure. A brilliant tutorial. Thank you I had forgotten how do this as it was nearly 5 years since I made one. Did have to use half hot and half cold water as that was the only thing I wasn’t sure on. Glad you enjoyed the tutorial. It was lovely to revisit this article as it’s been a while since I first posted it – nearly 7 years. I may publish this one on my Facebook page to share it with those who haven’t seen it before. An easy to follow tutorial with great results.Have you ever done this process on coloured silk? My reason for asking is that I have a quantity of coloured silk in long lengths in three different colours given to me by a friend who bought them in Thailand.I know the colours will react differently but can’t find any info suggesting what to do and don’t want to spoil the fabric. Hi Susan – many apologies for not replying sooner. I didn’t get notifications for many comments. So to your question – glad you find the tutorial clear to understand. And no, I don’t think I have used coloured silk before. My suggestion to you would be to just tear off a tiny strip of each piece of fabric, soak them and add a little coloured dye to each. Microwave and see how it looks. My feeling is that you should be absolutely find provided that this is pure silk and not a mix. If it’s a mix, you could have problems. Good luck. Did you use aluminum foil ??? It doesn’t go in the microwave. I’m confused. Or is it just Saran Wrap ??? Hi Victoria – thanks for your comment. And yes, you are right, no aluminium foil in the microwave. If you look at the post you will see that I have used clear stretch wrap, Saran wrap for you, cling foil for the Europeans. I hope your microwaving turns out great. Do you know if I can go back and add dye after the scarf has been microwaved and air dried? I have just a few white spots that I would prefer colored. Thank you!